Asus has announced the launch of ROG Masters gaming tournament in the Asia-Pacific region and the India Qualifier. The tournament will an annual event hosted by the company and will be held in five regions and offers a total prize pool of $ 200,000. The team registrations of the ROG Masters India Qualifiers 1 have already begun and the playoff winners of India Qualifier 1 and 2 stand a chance to directly enter the second stage. The grand finale will be held in Kuala Lumpur on November 12 and 13. Taking the gaming industry by its strides, ASUS announces the launch of ROG Masters in Asia-Pacific region. The tournament provides a platform to every gamer in India and Asia to showcase their budding talent to the gaming community across the world. The ROG Masters will be an annual property which will be hosted by Asus year-on-year and aims to be one of the top sought-after tournament in the Asia Pacific region in the coming three years. ROG Masters APAC consists of five regions i.e. Oceania (OCE) (Australia, New Zealand), East Asia (EA)(Japan, Taiwan, Korea, Hong Kong & Macau), South East Asia (SEA)( Indonesia, Thailand, Vietnam, Malaysia, Singapore, Philippines, Myanmar, Cambodia), China(CN) and lastly Rest of Asia (ROA)( India, Bangladesh, Nepal, Srilanka, Maldives). With a total prize pool of USD $200000, the tournament will also have two regional online ‘India Qualifiers’ which will ensure that not only the top teams, but also the upcoming teams get a chance to compete against the best and showcase their talent. The team registrations for the ‘ROG Masters India Qualifiers 1’ have already began and the playoff winners of ‘India Qualifier 1’ and ‘India Qualifier 2’ will stand a chance to directly enter the second stage (Single elimination) of ROG Masters ROA (Rest of Asia). The grand finale – an offline event – will be held in Kuala Lumpur, Malaysia on 12th and 13th of November. ROG Masters India Qualifiers allows a team, as many as three maximum chances to qualify for the APAC ROG Masters tournament. ‘India Qualifiers 1’ starts from September 10, 2016 for which the registrations have already begun. ‘India Qualifiers 2’ is scheduled between 18th and 24th September 2016, for new teams and for teams that couldn’t qualify for the Qualifier 1. Moreover, APAC ROG Masters platform offers yet another opportunity to the teams to qualify and proceed with the APAC tournament. A total of top 8 teams (4 DOTA & 4 CS:GO) will be the winners of the India Qualifiers 1 & India Qualifier 2 which will play in the India LAN Finals at Blitz Gaming Zone, Bangalore. 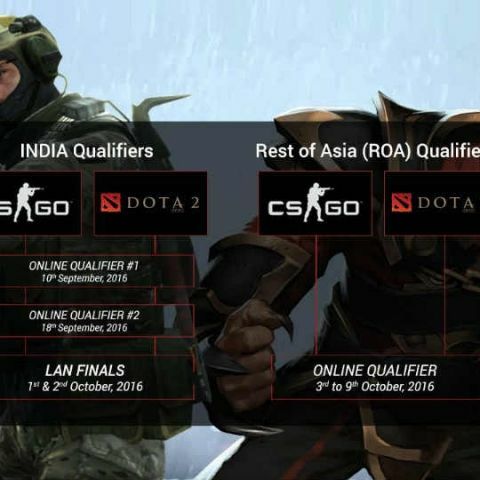 The final 4 winner teams would directly represent India at second stage of the ROA Qualifiers for APAC Tournament. Registrations for the ROG Masters India Qualifiers 1 have already begun and the tournament will start on September 10, 2016.